What a Finish to the Season! What an amazing finish to the season, only it wasn't. An injury time header from Patrick Bamford guaranteed Boro a 5th place finish and a play off semi final against Aston Villa. More importantly it showed we still have form and momentum going into these head to heads. But what a finish to the league programme it was, right down to and beyond the 90 minutes before our destiny was clear. 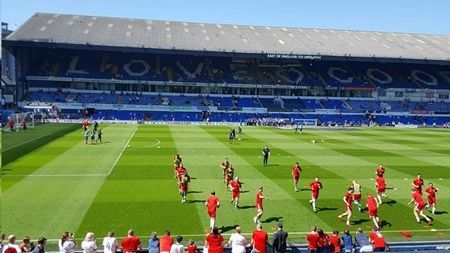 Yes, Boro were certainly in no mood for the beach although it was boiling hot beach weather, necessitating drink breaks in both halves. A 12.30 start meant that the travelling fans had to get up really early for this. But it would all be worthwhile after a scintillating climax to the game. Boro dominated possession from the start, Britt and Traore made a real nuisance of themselves. Mo Besic was buzzing around and all the Boro players were interlocking well. Dani Ayala quite outstanding from the first minute onwards, as measured in his passes as his header and tackles. But we were shocked when totally out of the blue Freddie Sears skipped through from the right and cracked a drive beyond Darren Randolph. 1-0 to Ipswich. At half time it was nostalgia time for the home fans as the Cup Final winners of 1978 lined up to the interviewed. Earlier there had been collections for manager Sir Bobby Robson's north east based cancer charity around the ground. Once again Boro went for Ipswich from the restart. Derby were 1-0 up and frequent updates in the seats indicated they were romping it. We had to respond if we wanted to finish fifth, Surely we did. Cross after cross from Traore, Friend and Downing and even Shotton hit the right spot but no one could get on the end of it. So, on came Bamford for Howson to beef up the attacking options. He was immediately into the action as he deftly rounded a defender to break away at full pelt. Sadly, Britt underhit his return pass in the box as the two carved their way through the centre of the pitch. Shot after shot was blocked by a forest of Ipswich legs as Boro piled on the pressure. Something had to give, surely. And so it proved, our patience was rewarded when Downing threaded a shot into the corner of the net from the edge of the box. I thought we would now romp it but maybe we relaxed a bit, thinking the job was done. Ipswich looked all at sea when we hit them on the break. But then the home team struck back. Gibson felled his man, in our box. Clear penalty. Goal. 1-2. Oh no. Boro piled forward again. Harrison came on to add to our threat. There was block after block, save after save. Besic hit the bar. Ayala followed up. Goal. No. Offside. Ecstasy and agony. Beyond the five minutes of injury time. One last effort. Traore too tired to run over to take the corner. Harrison curled it in and Bamford powered it home. 2-2. Wow. Wow. Wow.